With more and more companies seeing the benefit from having a website designed that responds to almost any viewing device from desktops to mobile phones. Companies began to realize the additional benefits of "Responsive Design" to your SEO campaign are quite significant, allowing for more people viewing on more mobile devices was great. With Google changing the algorithm to include a change in ranking if you have a mobile site, one that specifically benefits responsive web design and web development, this is one change that you cannot afford to miss out on. Users can now access the same content and functionality – that they will find on their smart phones and on their tablets. With more people constantly on the move and connected by means of their portable devices, companies are benefiting from the engagement from a generation that is constantly connected, and their "Shopping experience" relates to their experience of your "Sales funnel". 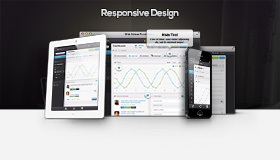 A multitude of business's are realizing that a well designed responsive website is a better option for today’s constantly connected consumers who want to be able to access the same content on all of their devices. Responsive websites that adapt automatically and elegantly to all devices are the better and more revolutionary solution. With many of the devices being constantly connected to the clients social media platforms, the connection between product, brand and the social media is closer and more integrated than ever before. Instead of having to develop and manage content for multiple websites, responsive design enables a unified approach to content management, as all content is contained within a single code base on the web server. The same applies to analytic s and strategy development and deployment – unified, integrated and comprehensive. With many of the current popular CMS's being built to accommodate this change in responsive development, practical solutions are becoming far more affordable than ever, they are design to accommodate web standards and are ideal platforms to work with when considering SEO - If you would like further information or just a no obligation discussion about this area of our services, please feel free to contact us.